We are delighted to announce the publication of our journal supplement on gender and health systems research! This supplement brings a gender lens to bear on the health system, uncovering new learning which can help us to build more equitable and people-centred research, policy, and practice globally and in different low- and middle-income countries. The papers cover a range of health issues and health systems areas and use a range of methods. The findings demonstrate that gender intersects with other axes of inequity within specific contexts to shape experiences of health and health seeking within households, communities and health systems. The supplement is an important step in drawing together emerging evidence on gender and health systems and encouraging others to adopt a similar lens. 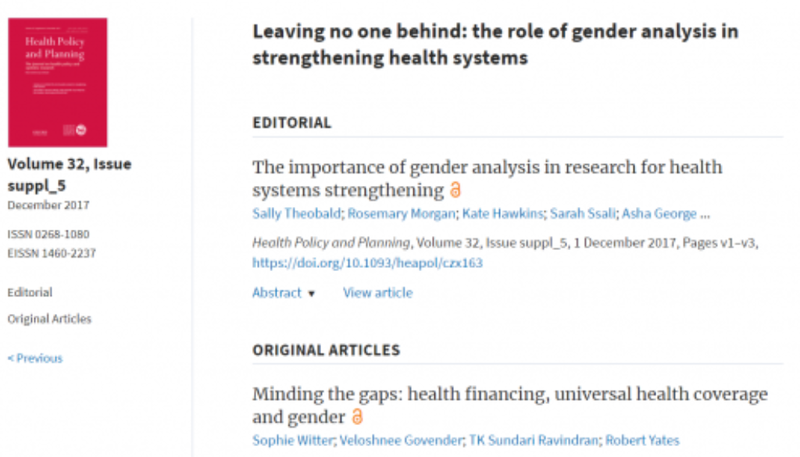 For additional information about this supplement read Kate Hawkins’ blogon the Health Policy and Planning website, or listen to this podcast where authors Sally Theobald and Kui Muraya discuss why they think gender analysis is important within health systems research. To view the supplement visit Health Policy and Planning.